26 | Information online: rentonwa.gov/neighborhoodprogram or call 425-430-6595 NEIGHBORHOOD PROGRAMS Partnering for Great Neighborhoods Mini Matching Grants These grants are for projects under $500 and are intended for small neighborhood projects, programs, educational opportunities, and infrastructure support. Mini Grant Ideas include: • Coordinating a "Screen on the Green" movie night • Holding a neighborhood clean-up or other special event • Implementing art into your neighborhood • Hosting an educational workshop • Financing a space to hold a neighborhood meeting Mini-grant applications are available until November 10, 2017 Thank you Renton Neighborhoods! The City of Renton Neighborhood Program would like to give a huge thank you to all of our 2017 Neighborhood Program grant participants. The City awarded over $100,000 in neighborhood grant funding to over 40 different Renton neighborhoods. Neighborhood grant funding covered a variety of different projects and events, including outdoor fitness and playground equipment, holiday parties and events, and neighborhood newsletter and website design. 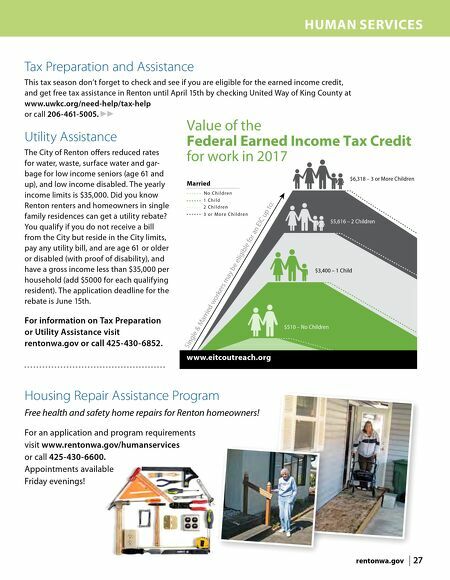 To learn how your neighborhood can apply, please call 425-430-6595 or email neighborhoodprogram@ rentonwa.gov. 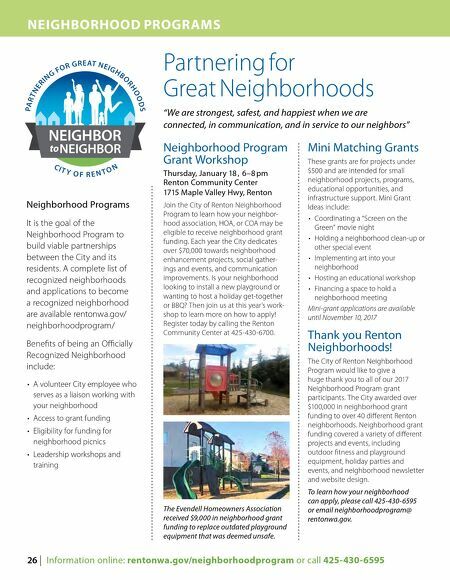 Neighborhood Program Grant Workshop Thursday, January 18 , 6–8 pm Renton Community Center 1715 Maple Valley Hwy, Renton Join the City of Renton Neighborhood Program to learn how your neighbor- hood association, HOA, or COA may be eligible to receive neighborhood grant funding. Each year the City dedicates over $70,000 towards neighborhood enhancement projects, social gather- ings and events, and communication improvements. Is your neighborhood looking to install a new playground or wanting to host a holiday get-together or BBQ? Then join us at this year's work- shop to learn more on how to apply! Register today by calling the Renton Community Center at 425-430-6700. The Evendell Homeowners Association received $9,000 in neighborhood grant funding to replace outdated playground equipment that was deemed unsafe. Neighborhood Programs It is the goal of the Neighborhood Program to build viable partnerships between the City and its residents. A complete list of recognized neighborhoods and applications to become a recognized neighborhood are available rentonwa.gov/ neighborhoodprogram/ Benefits of being an Officially Recognized Neighborhood include: • A volunteer City employee who serves as a liaison working with your neighborhood • Access to grant funding • Eligibility for funding for neighborhood picnics • Leadership workshops and training "We are strongest, safest, and happiest when we are connected, in communication, and in service to our neighbors"